Prof. (Dr.) Amit Wason, is highly qualified and a good researcher in the field of Electronics & Communication Engineering. He has authored more than 50 research papers in International & National Journals and Conferences and added one International research book to his credit which was published in Germany. Most of his publications are in the well-known International Journals of Elsevier. He is a members of many professional bodies such as IEEE, SPIE, UACEE, ACEEE and a senior member of IACSIT. 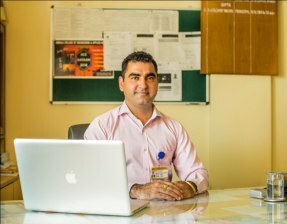 He is a member of Editorial board and reviewer committee in many reputed journals. He has guided a number of M. Tech thesis and is presently guiding Ph.D thesis under different Universities. He was graduated (B. Tech) in 2001, Post graduated (M. Tech.) in 2005 & Doctorate in 2011 from Thapar University, Patiala. ACE, over 12 years, has served the society and has carved a niche for itself as a pioneer institute & has been nourishing the industry with the intellectual resources its produces. The institute has always been striving to cater to the most predominant needs of the industry by providing a discerning balance of academic precision and practical prudence. The business prospectives are changing rapidly at a very fast pace and ACE has been rehabilitating its self to suit these needs. ACE has been functioning with a noble vision and mission clearly reflecting its social responsibility and commitment to nation building. The mission of ACE is “to develop the entrepreneurs who are job providers not job seekers”. Faculty members here at ACE are making a mark with some very good teaching and with research both theoretical and experimental. Most of the faculty members at ACE have published a number of Research papers in the International/National Journals and conferences. On behalf of the Institute, I welcome you to ACE, a place where we celebrate youth and excellence and attempt to transform young persons into adults with a sense of social responsibility, human values and concern for environment. We hope that you would use this opportunity to realize your full potential and bring out the best in you. We are sure that the excellent academic environment and the opportunity to participate in applied research activities will also help you not only in developing your personality and in your all-round development but your intellectual level will also be enhanced.